My 2K9 Team-Full Of Cuties! Before I begin, let me just say this: If any of my Haldane teachers came to check out my blog and this is what was posted, please don’t judge me. You might want to scroll down to the post about the 3-2 win over the Angels. Okay. I got Major League Baseball 2K9 for my birthday for PC, and I made a team. I did a draft as the Yankees and made sure I picked cuties. I think almost all of the cuties on this team were mentioned in the division cutie posts. Ichiro leads the league in steals in my game. Look at his smile! Priceless! Tex is adorable! He leads the league in homers and RBI’s in my game. Oh, Andre….everyone knows I love Andre. That’s why I made sure he was the first player I got! Ian was having a fantastic season, before that stolen base…. Quietly hitting very well for my 2K9 Yanks. Every time he is up, I try and hit the ball to the opposite field for a single. He leads my team in batting average, so I keep doing that! Solid all around, when I need a hit, Jerry gets it. Of course Cervelli is my starting catcher. I screamed when I found out he was in the game! Pretty cute team, huh? 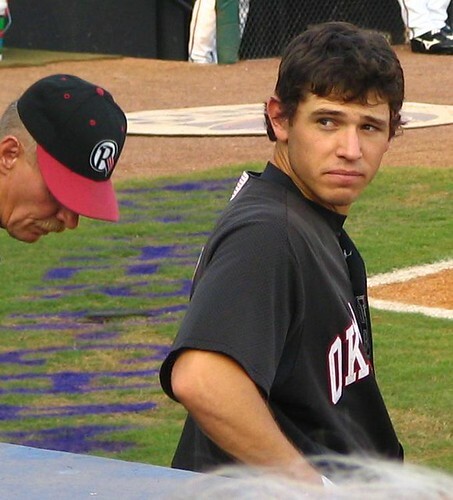 There was one horrible thing that happened involving Ian Kinsler. I tried to steal a base as him, and I went into second sliding. I was happy I was safe, but my happiness was cut short. Ian got hurt, something with his finger. I put in one of my benchies to play for Ian, and I finished the game. I won! But after the game, I got the news about Ian. He tore his finger ligament and was going to miss at least 60 games. I was so mad. I was planning on exiting the game, without saving the game I just did, but it autosaved! Ian Kinsler was injured, and there was nothing I could do about it. So I got a replacement. 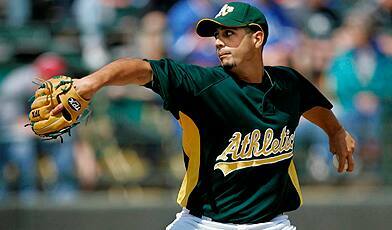 Freddy Sanchez! He is filling in nicely so far. When Kinsler comes back, I will have to decide what to do with Freddy. But I have time to think about that. I’ll show you my pitchers after the next off-day. The season is winding down….it’s getting sad. Yankees all the way this year! I hope you enjoyed this cutie post. Virginia’s Top 5 Favorite Non-Yankee Cuties!!! Ahh…it’s that time again. When the Yankees are off, my mind shifts gears. 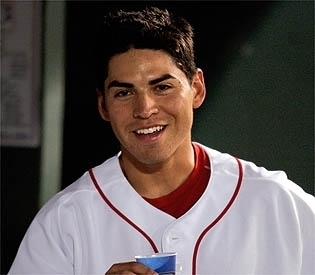 I think about how cute baseball players are. There are so many adorable ones. I love all 25 of my Yankees, evem the ones that are not physically attractive. But there are plenty of non-Yankees who woo me just the same. I’m going to narrow it down to 5. Let’s countdown, starting with the 5th cutest and ending with the most cute non-Yankee. Everyone knows that I just love rookies. But hot rookies are even better. 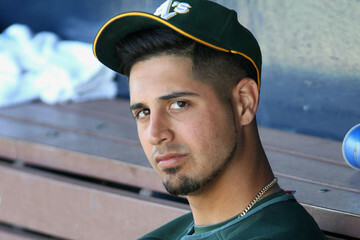 That is why I like Gio Gonzalez. I saw him pitch against the Yankees once. He had an ERA of about 8, but he pitched a fabulous game against my Yanks, making them look foolish and lost at the plate. So a rookie who is hot AND a good pitcher? Now you see why he is up here. Ian is a hottie if I ever saw one. He also plays the game well. There were periods of time where Robinson Cano got on my nerves, and I wished that Ian Kinsler was the 2nd baseman for the Yankees. He is a hard-nosed ballplayer that any team would like to have. And he is adorable. Nice, clean cut handsome man. I love him. This guy is gorgeous. 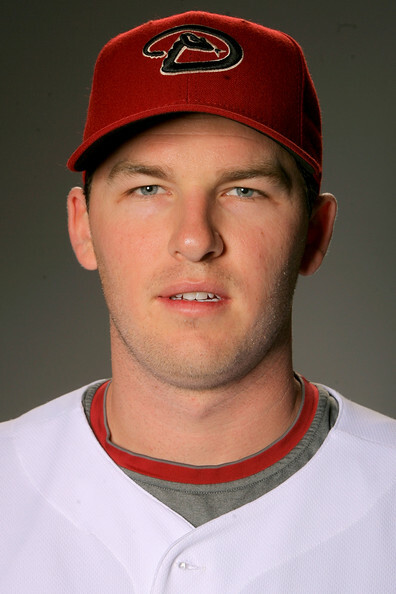 If you are a female who watches baseball, you must have a thing for Grady. You would have problems if you didn’t. Don’t be shy, just let it out! Everyone knows he is hot. I am a Grady Lady at heart. I also love the way Grady plays the game. He is a fabulous centerfielder who always makes unfathomable plays in the outfield. He is just amazing. He has all the tools to be a superstar, and a superstar he is. Grady is awesome! B-rob is an extreme cutie!!! He is down right adorable. I think his size makes him cuter. Brian is short, only about 5’9″. The fact that he is a little guy who is so good at baseball is so cute. I love the speed Brian brings into the game. His customary “dance” off the bases as he takes his lead is hilariously cute. He is a base-stealing wizard. His speed also helps him man the 2nd base spot, where he is pretty smooth with the glove. I love Brian Roberts. Andre. Andre Ethier. I bet this was a surprise, hahaha. I absolutely adore Andre. You all know about how my fellow blogger Cat got Andre to sign a shirt for me, which I treasure. But why did I want an Andre shirt in the first place? What made me, a Yankee fan till the end, like this little Dodger so much? Hm. 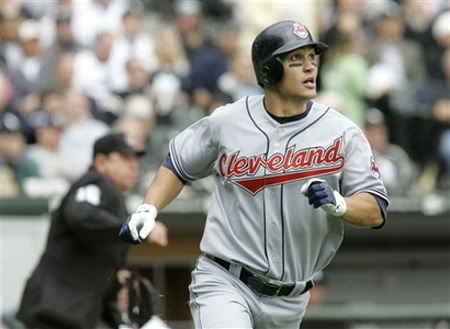 I saw him once on MLB Network, and immediately fell in love with him. Then when I started my blog, I bumped into Cat. I loved her page because of all her photos. I saw Andre photos everyday. I saw his pregame rituals, he and his teammates, and his quirky habits in the outfield. I felt like I knew Andre, which made me love him more. I realized that he is more than a handsome face: he is a wonderful man. Andre is an extremely talented ballplayer, a man whose charm is captivating, and an even better person. 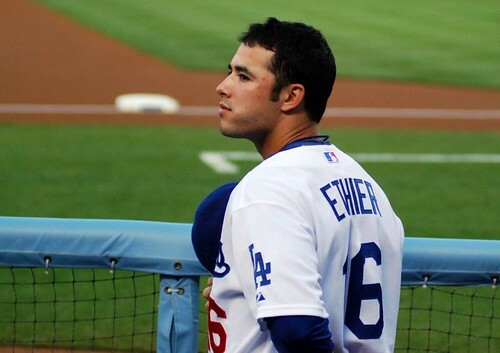 That is why I love Andre Ethier. He won this #1 spot without a doubt. I hope for Andre to wear Yankee pinstripes one day, but then I feel bad about taking him away from Cat and the other Dodger fans who love him. It’s alright, though. I don’t mind admiring him from a distance. This is it! The last cutie post and by far the most anticipated!!! The NL West is filled with heartthrobs. Being a Yankee fan, I don’t really get to see too many of these guys play. But thanks to my fellow NL West bloggers, I get a glimpse of them every once in awhile. Let’s begin with the Dodgers. OMG I love this man. Hottie!!! And he is very sweet. He signed a shirt for me. Andre is one of my favorite baseball players. He is my favorite non-Yankee. LOVE YA, ANDRE!!! This little cutie is only 21, and he is already pitching greatly. Matty is putting up great numbers this year. He is very cute. Who doesn’t love Russell? This cutie is a great catcher. This guy is just adorable. What a cutie!!! Troy is the cutest thing!!! Jeff is one of the cutest pitchers. I feel bad that he is hurt. He looks so sad in this picture! But trust me, he is quite a cutie! The Freak! This guy is adorable. He is so little, but so good. I love him! Freddy is a cutie!!! I think he is amazing. Barry has always been a cutie. I’m glad he is having a nice season. David is a cutie. He is on my cutie baseball team. Hyunyoung loves him, too! This one is for Kaybee, and I have to say, I’m starting to love this guy! I think he is a real cutie. Kaybee, Hyunyoung, what do you think? Doug is pretty hot, despite the facial hair. Duh! Andre is my fav!!! You’ve all seen the heartthrobs of the AL East, now let’s do the rest of the AL. This rookie is especially cute because he gave Pukilis a headlock takedown! He just looks like a baby. If you take away the goatee, he’s really cute. This power hitting outfielder is pretty hot. This speedy outfielder is pretty cute. The hometown hero. How cute is that? I remember when he was hit in the face by a liner from Abreu. He’s still cute. Just look at him. Hot, cute, everything! I’m a Grady Lady at heart. He looks so young! He is cute. He’s good, he’s underrated, and he’s very cute. I remember watching him as a rookie. I thought he was cute. 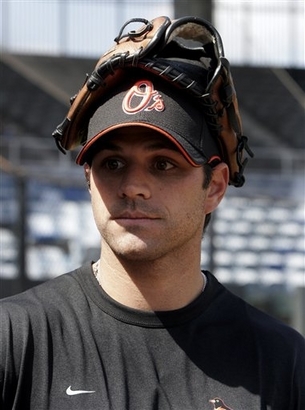 An amazing ballplayer, and really hot. A very inspiring story. He is so cute. I hope he is a Yankee someday. He’s like Elvis. Just his first name. And cute. A newer Mariner, and a cutie. This rookie is pretty hot. He was so good in his prime. But he is still cute. Very underrated. I think he’s adorable. Melky might have a thing for him, too! Alrighty. Those are the rest of the cuties and hotties of the AL. National league is up next. There are a lot of players who are “cuties” and “hotties,” so I may have to split this post up into a few smaller posts. As you all know, I love every one of my Yankees, so I’m only going to name a few. EJ, you might not like this post too much. Melky always finds a way to make me laugh. He is a cutie. Francisco is just adorable. I love him. He is a cutie. He looks like he is a baby. Ramiro is the cutest little rookie. Sergio has movie-star good looks. He is classified as a hottie. Tex is adorable! He’s perfect! He is a cutie! I like the way Jacoby plays the game. He’s cute. Carlos said he was proud to be a Ray. That was before they were good! Cutie! I don’t know, he’s just a cutie. Marco bounced around from team to team. Now he has a home. He’s a cutie. CUTIE ALERT! I love this guy!! Nick is a cutie and a hottie. And a great ballplayer! Another cutie on the Orioles. This team is chock full of them! This little rookie is a hottie! Those are all the cuties and hotties of the AL East. The other divisions will be coming up soon!